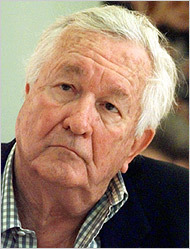 William Styron, the author of The Confessions of Nat Turner, Sophie’s Choice, and Darkness Visible, the latter book being one of the more compelling memoirs on depression that I’ve read, has passed away. He was 81. Like Mailer, Styron built up a literary reputation early, pumping out Lie Down in Darkness at the ripe young age of 25. But Styron is perhaps best known for The Confessions of Nat Turner, which not only earned Styron the Pulitzer Prize but had him decried for depicting Nat Turner in less than heroic terms and for being a Caucasian depicting an African-American experience. Styron was one of the mighty handful that founded the Paris Review along with George Plimpton. And you have to respect a guy who got into the novel writing business because McGraw-Hill fired him for throwing balloons out of an office window.